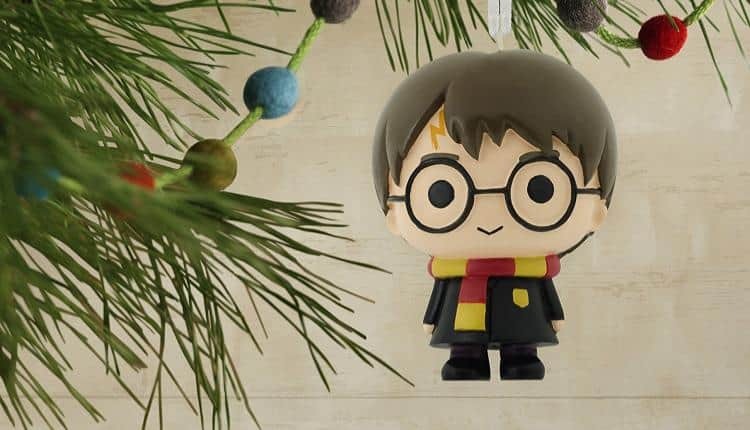 21 Best Harry Potter Christmas Ornaments for 2018 (Updated!) | Nerd Much? There’s no better way to add a touch of magic to your holidays. With the first heavy snowfall of the season, thoughts turn from the spooktacular to yule tidings. Do you remember Harry Potter’s first Christmas? Hagrid dragged 12, 10-foot trees behind him as thick snowflakes tumbled on the wind. Once in the Great Hall, Professor Flitwick helped to decorate them all with glittering ornaments and lights. It seemed that the castle itself shivered with anticipation, as so many of the school children were. With December fast approaching, it’s time to capture a little of that nostalgia as you begin to deck your halls. 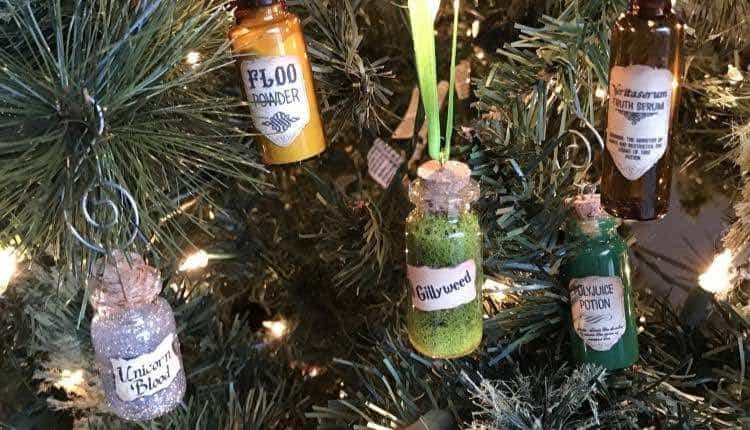 There’s no better way to add a touch more magic than to trim that perfect tree with some fantastic Harry Potter ornaments. Show your pride with a crest (or four), have a Hogwarts letter for each family member, or add a little sentiment to your holiday decorations this year. 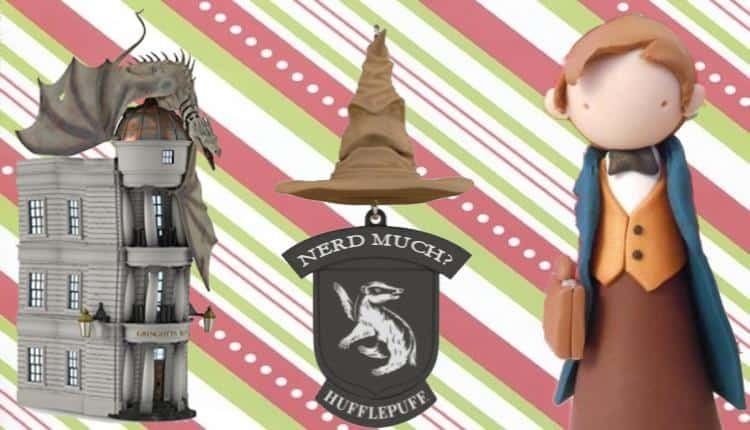 These nerdy ornaments may not make your tree stack up to the ones in Hogwarts’ Great Hall, but they’re sure to put a smile on any Potterhead’s face. No Potions Master would be caught dead without a sample of the Harry Potter universe staples on-hand, though Professor Snape may deduct points for improper storage. These amazing little bottles are handmade by Rock & Luna. They come with three hook options to choose from, or no hook at all if you prefer to display these year-round. Pick your poison (or, your potion, as it were) from a selection of seven options, ranging from innocuous Floo Powder to the notorious Veritaserum. Bottle sizes vary between 1½” to 3” depending on your potion selection, and each cork is sealed with a clear glue, so you don’t need to worry about getting unicorn blood out of your carpet should it fall. 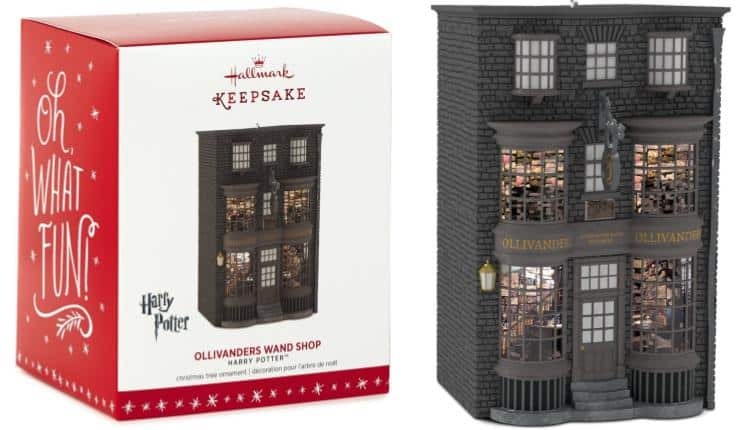 “Wand” a little piece of Diagon Alley on your tree this year? Then check out this replica of Ollivander’s Wand Shop by Hallmark. This beautiful brick building ornament has an insane level of detail, you can even see the rows upon rows of wands if you peer into the tiny windows; maybe one of them is yours! The plastic ornament measures 2.7” x 4.3” x 3.1” and boasts an incredible level of artistry. Each window shows a different view of the shop’s interior, though some boxes are piled up blocking the view of the top two! As fine wand makers since 382 B.C., you know you’ll get nothing but quality with Ollivander’s! Likewise, this quality ornament will wow your guests and last for years to come. Who doesn’t want a dragon on their Christmas tree? 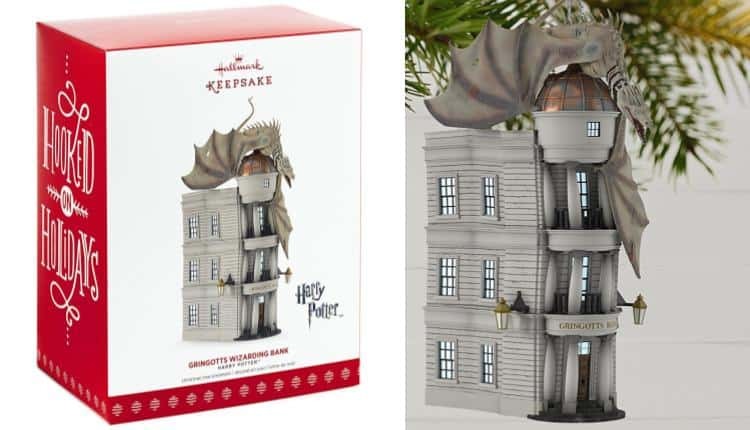 Now you can have the iconic Ukrainian Ironbelly perched atop your very own Gringott’s replica, designed by Orville Wilson. This 2017 collector’s edition by Hallmark measures 3.4” x 6.6” x 4.8” and comes with its very own holiday-themed box for storage or gifting. The level of detail and artistry is astounding on this lightweight plastic replica and is sure to wow your most steadfastly Muggle friends. What’s more, you can add a little more magic with the optional lighting attachment to provide a memorable light-up effect. 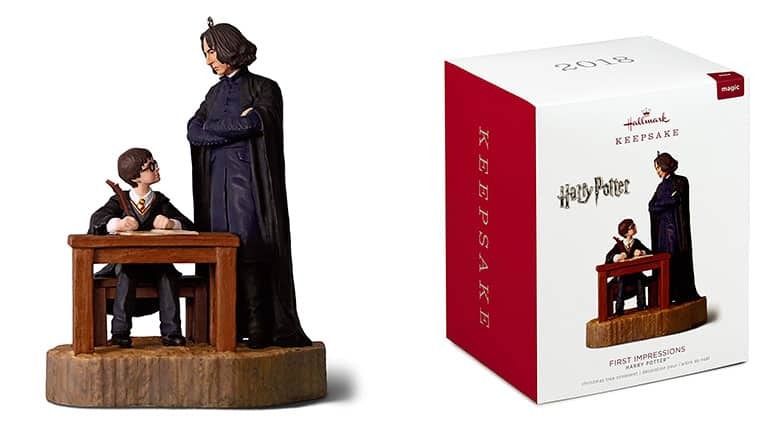 This year’s new Hallmark Harry Potter ornament is quite possibly their best yet, with Severus Snape looking over Harry Potter. 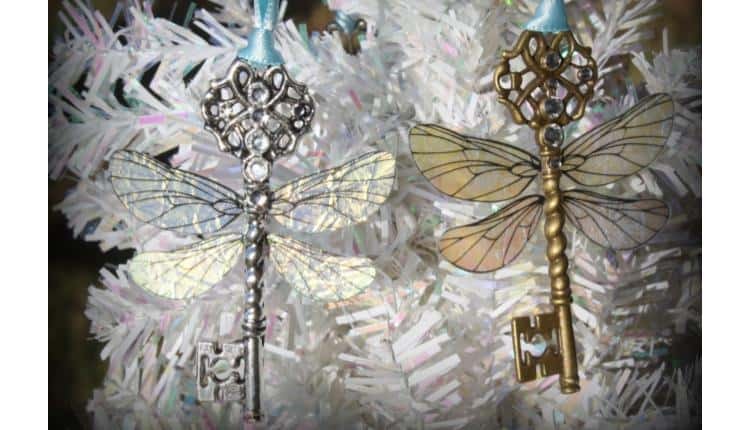 Take a nostalgia trip back to the first book with these dazzling flying winged key ornaments from Christalinasales. No need to get on a broomstick for them, though; Professor Flitwick made a point of disenchanting these ones. 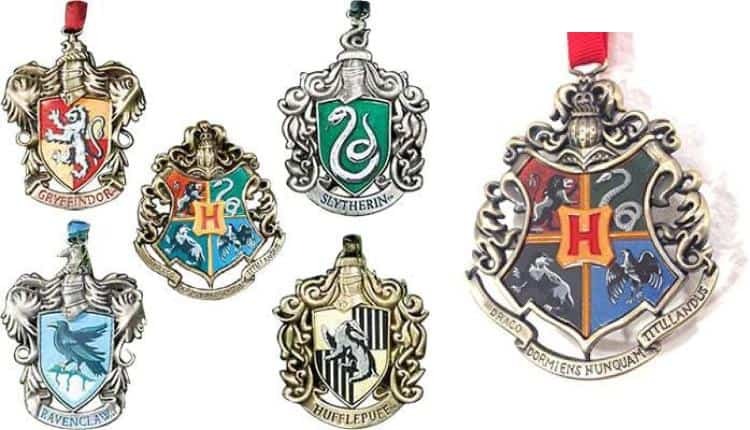 These handmade Harry Potter Christmas tree ornaments come in 6 different styles, and range in size from 2¼” to 2¾” depending upon the design you choose. Each key is real pewter with silver or bronze overlay and comes fastened to a blue ribbon for easy hanging. The delicate wings are double-sided to best show off their iridescence in the Christmas lights. “There is nothing hidden in your head that the Sorting Hat can’t see, so try me on and I will tell you where you ought to be.” Every Potterhead worth their Bertie Bott’s has already taken any number of Sorting quizzes to see which house they’d be in. 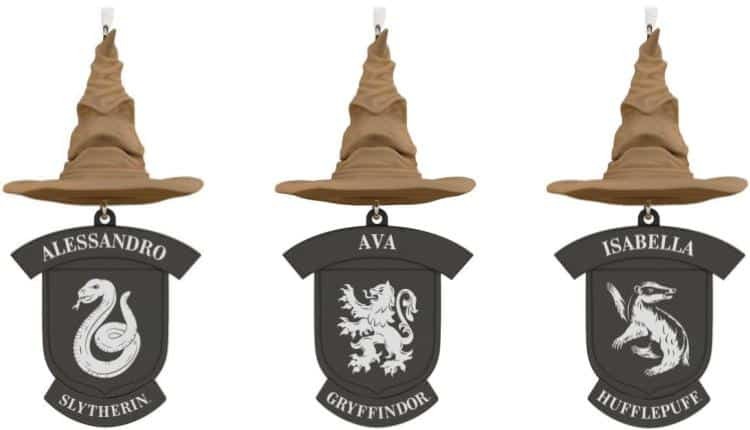 Now you can commemorate your house pride with a personalized ornament to hang on the tree every year at Christmastime! Each ornament is approximately 3” x 6” and can be fully customized with your house crest and the name of your choice. The Sorting Hat itself is a resin cast, and the crest is a grey-finished metal. Get one for yourself, or as a gift for the Potterhead in your life. 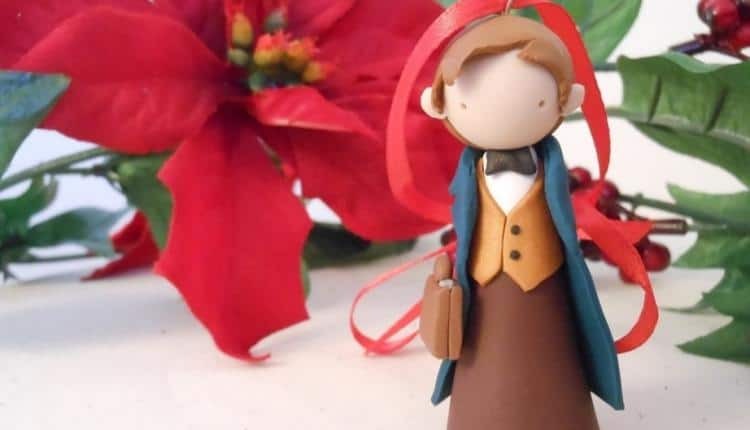 Changing things up from the original canon, we have an adorable Harry Potter Christmas ornament depicting Newt Scamander from Fantastic Beasts and Where to Find Them by chibiwings. This 2¼” polymer clay figure is perfect for your nerdy Christmas tree or to have out year-round. Each is handmade with excellent craftsmanship, boasting clean lines and surprising detail for such a tiny figurine. Suspended by a red ribbon, this ornament is sure to get your Fantastic Beasts-loving friends talking this year around the Firewhiskey. Even if they’re not fans of the new franchise of the Harry Potter Universe, nobody can deny that this ornament picked up Newt’s charm! Is your Christmas muggle worthy? Now you can make sure with this 3½” diameter glass print ornament from StarFire Prints. This gorgeously detailed tree ornament depicts an animalistic eye peeking out from a suitcase lock. Each ornament’s illustrations have been fused to the glass, ensuring scratch and fade resistance. The ornament includes a string to hang upon, making it tree-ready in moments. As we’ve seen in Fantastic Beasts and Where to Find Them, Newt’s suitcase isn’t always as secure as he’d hope. This ornament will show your appreciation of the movies while still staying within MACUSA regulations. 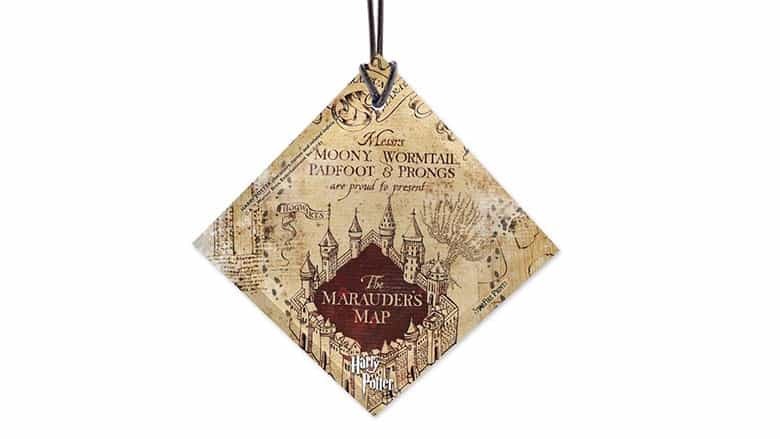 This 3.5″ diamond-shaped glass Harry Potter ornament features the Marauder’s Map. This set of six ornaments is part of the Hallmark Keepsake collection, and are sure to fill your holidays with a sense of magic. Originally produced in 2000, these ornaments are now considered collectibles, perfect for the steadfast Potterhead with an eye for rarity. 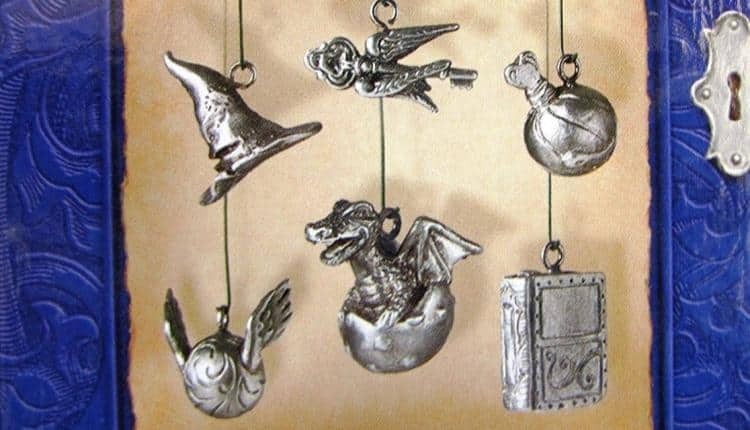 Each of these pewter charms is approximately ¾” x ¾” in size and come in a book-shaped box to store them. They may not be Chocolate Frog cards, but nobody could argue that these pint-sized depictions of baby Norbert(a), the Golden Snitch, or the Sorting Hat aren’t completely adorable. There’s no Hogwarts experience without the scarlet Hogwarts Express, barring access to flying Ford Anglias of course. Now you too can have a recreation of this iconic steam engine in miniature for your holiday tree. 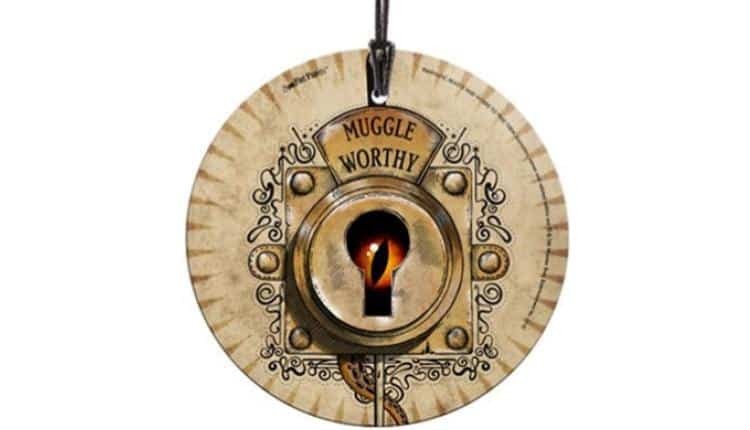 This ornament is only otherwise found in the magical Wizarding World of Harry Potter, so if you can’t make it down to Florida, bring the magic to you this Christmas! 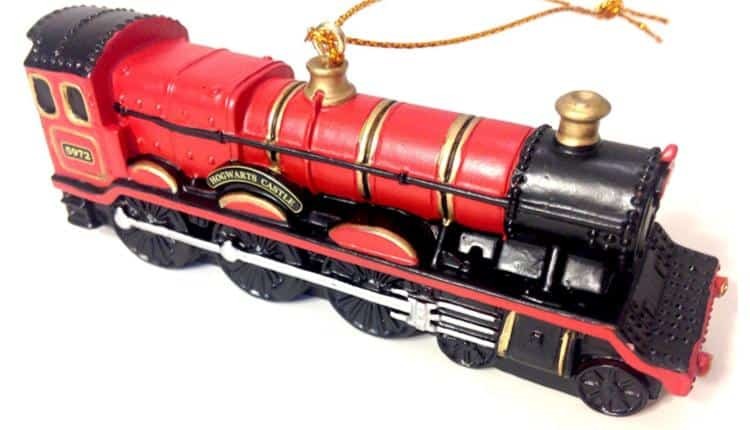 This painted resin ornament measures 4” x 1½” x 1½” and looks identical to the train used in the Harry Potter movies. The level of detail is exquisite, and the ornament comes with a gold cord to hang it up. It wouldn’t be a Harry Potter list if this symbol didn’t crop up at least twice. 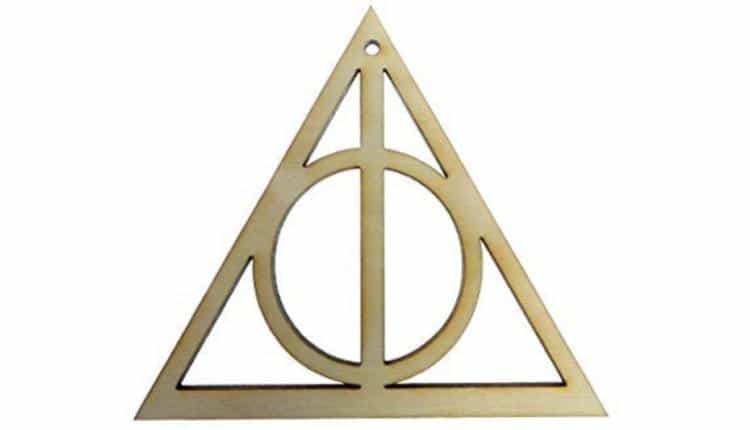 This laser-cut ornament by CharlestonOrnaments is perfect if you’re looking for a simple homage to your favorite fandom. This natural birchwood ornament measures 3” x 3” x ⅛” and is handmade in South Carolina. Crafted sustainably, the symbol boasts clean cut lines and a hole near the top to thread through some ribbon or a chain. 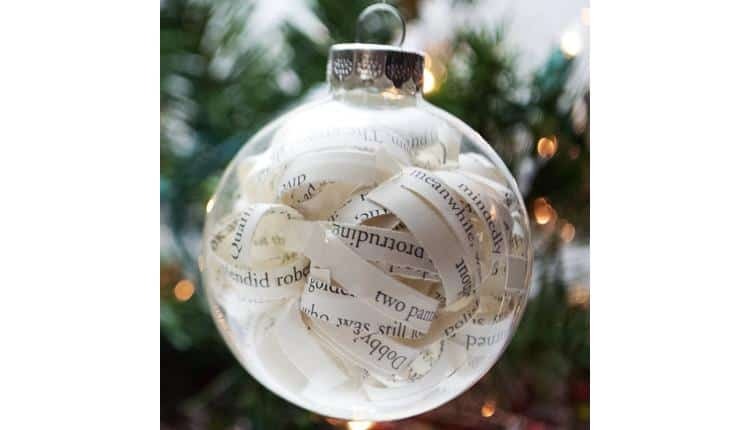 You can use it as an ornament for your Christmas tree, or string it onto a chain and wear it about your neck like Xenophilius Lovegood did at Bill and Fleur’s wedding in Deathly Hallows. 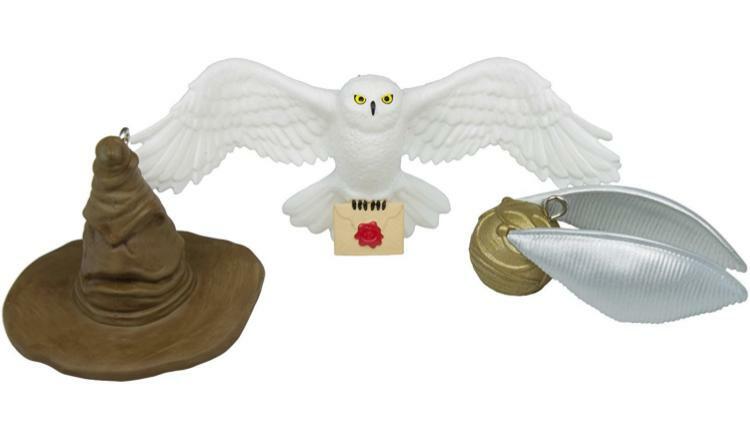 These miniature ornaments are from Hallmark’s 2016 collection and feature Harry’s owl, Hedwig, the Golden Snitch, and the Sorting Hat, all with eye-hooks to hang them. If you’re looking for charms to fill in those gaps in your tree while announcing your Potter pride, look no further! These amazingly detailed resin ornaments were crafted by artist Jake Angell, and are small enough to act as necklace pendants, should you choose to wear them as such. The Sorting Hat measures 1.31″ x 1.¼” x 1.28″, the Golden Snitch is 0.87″ x 0.62″ x 1.43″, and Hedwig is 2.60″ x 1.04″ x ¾”. So cute! Show off your house pride with these 4” crests from Noble Collection. These die-cast and colorfully plated ornaments are emblazoned with the crests of Hogwarts, Gryffindor, Ravenclaw, Hufflepuff, and Slytherin respectively. Exquisite quality and detail, from the illustrations to the fine engravings of the Hogwarts school motto: “Draco dormiens nunquam titillandus.” You can buy these crests in a set of five, complete with collector’s box, which means they could double as an excellently nerdy stocking stuffer for that special Potterhead in your life. 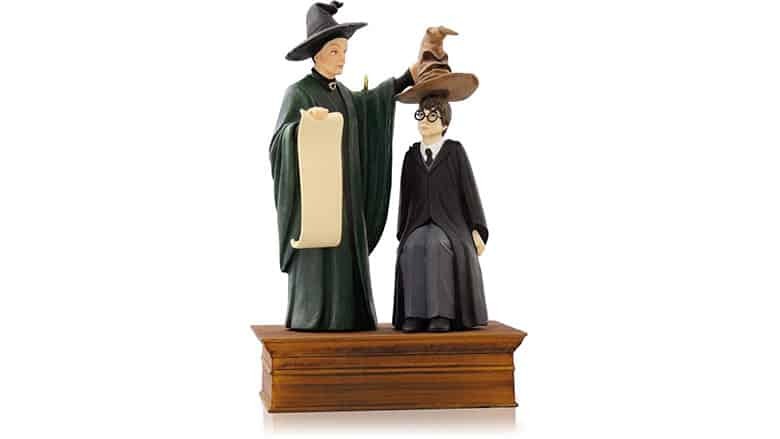 For those of you whose Potter love leans more toward the books, this Harry Potter ornament is perfect. This ornament is full of curling, coiled ¼” strips from the Harry Potter books themselves, and measures an approximate 2.6” at its widest point. Don’t worry, though; these books were salvaged just before being sent to paper mills, so as the seller says: no books were harmed in the making of these ornaments. So, when your friends comment on how cool these ornaments are, you can boast about your upcycling prowess, too. Each is handcrafted on a made-to-order basis, so no two of them will ever look the same! Each ornament comes with a 3” x 3” x 3” gift box to store it in, making sure that they remain pristine year after year. If your Christmas tree isn’t adorable enough, you’ve found your solution with these Hallmark figurines. Choose from one of the Golden Trio, Hedwig, or Dobby, and give this Christmas enough whimsy to even make Professor McGonagall smile. These endearing polyresin figurines are sold separately, but you probably can’t buy just the one. Each is 2” x 3” x 2”, and suspends from a ribbon attached to the head, which makes it easy to go from box to tree in as much time as it takes for you to unwrap it. 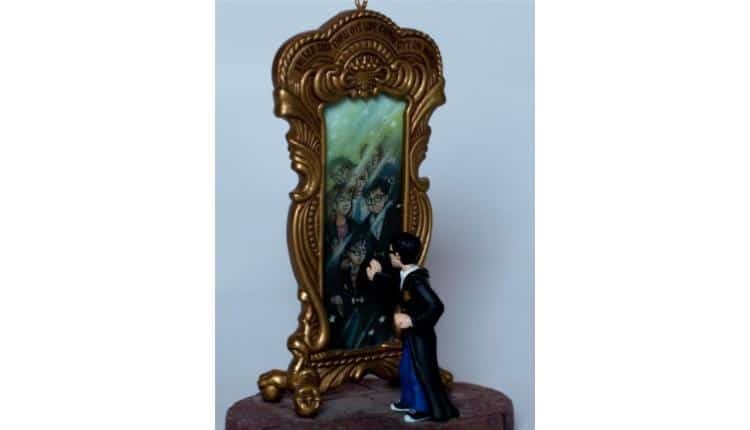 These figurines make excellent gifts for those newly inducted or younger Potterheads, but you’ll probably want one for yourself too! 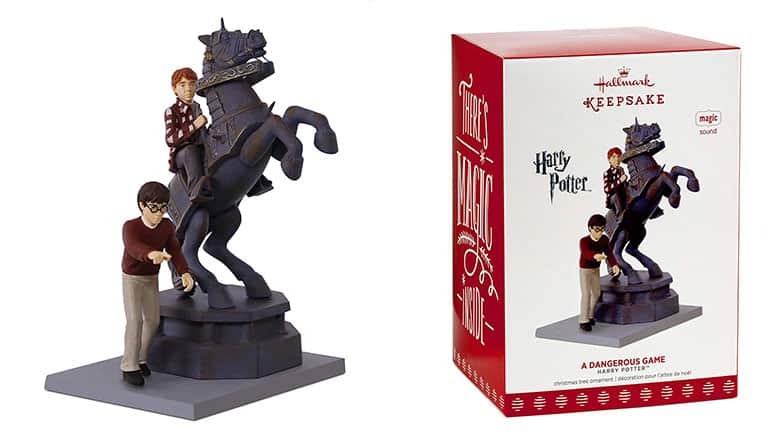 This Harry Potter ornament is based on the human chess game scene from Harry Potter and the Sorcerer’s Stone, and it’s from the 2017 Hallmark Keepsake collection. 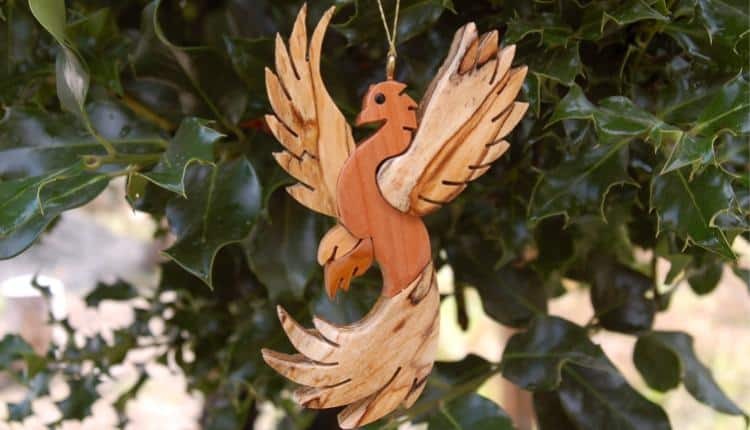 While not exclusively Harry Potter, this hand-carved phoenix ornament from GielishWoodSculpture is an amazing, if subtle, addition to any Potterhead’s ornament collection. Even Fawkes would shed a tear over the exquisite craftsmanship of this piece of artistry, so don’t let the lack of name brand deter you! This beautiful ornament is made from five different kinds of wood native to Oregon, and sealed with a clear lacquer. Each has a variance to wood grain and color, giving it a one-of-a-kind touch. Beautifully finished with no rough edges, these ornaments are an approximate 2” x 4”, with an approximate depth of ½”. “I show not your face but your heart’s desire” is inscribed, backwards, on the frame of the Mirror of Erised in the first Harry Potter book. Now, you too can have your heart’s desire by commemorating this touching scene in the series with this Hallmark creation. Sculpted by Nello Williams circa 2001, this ornament is an excellent addition to your collection, with amazing detail and illustration, right down to the curling ornate frame and Harry’s deepest desire… His family. This ornament measures 6½” x 3” x 2.9”, and is lightweight enough to feature on even the most spindly of trees. …That these etched ornaments will blow your mind. 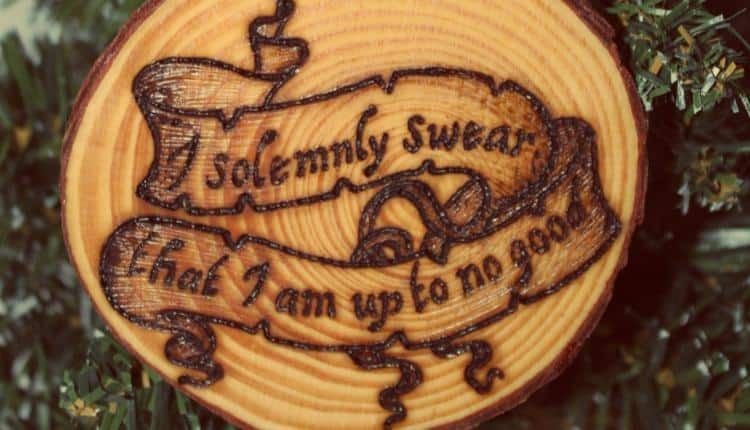 Manage a little mischief this holiday season with the passphrase for the Marauder’s Map, etched here on a log slice with incredible detail. All of these ornaments are sustainably sourced and handcrafted for the best possible infusion of magic and workmanship at a fantastic price. Each ornament is created from a slice of live-edge Irish wood, hand etched using traditional pyrography techniques and finished with a clear varnish to enhance the natural woodgrain. Measuring at an approximate 3½” diameter, these ornaments are perfect to infuse your nerdiness with a little rustic charm.